1. Your first time is the best time. 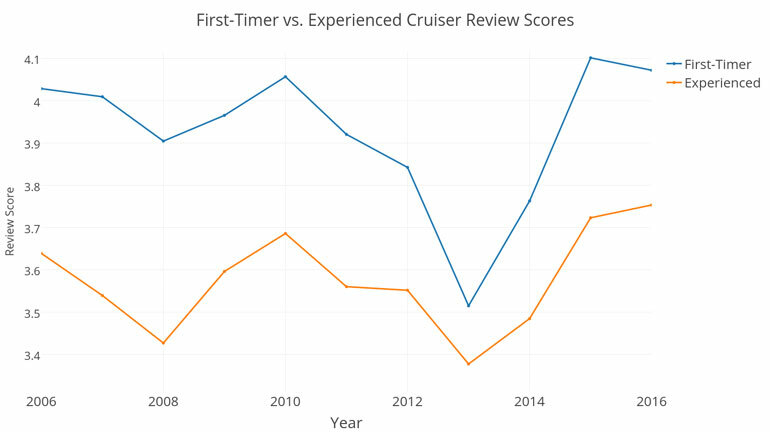 First-time cruisers don’t need to worry about enjoying their virgin experience at sea, because our data shows that average review scores from new sailors are about 10% higher than experienced sailors. When new cruisers take their first voyage, they aren’t really sure what to expect when they board the ship, but it doesn’t take long for them to be blown away by the outstanding service, the Broadway-caliber entertainment, and the extensive selection of onboard activities and dining. However, when they go on their second, third or more cruises, their expectations are much higher so they’re harder to impress. Are you taking your first cruise? Check out our for First-Time Cruide Guide for new cruisers to make sure you're fully prepared for an amazing cruise vacation. 2. People are having a lot more fun on cruises today than they were 10 years ago. When we compared review scores from 2006, 2011, and 2016, the results were clear: people are having more fun on their cruises and leaving more 5-star reviews than ever before. In 2016, 36% of the reviews we received were 5-stars, up from 25% in 2011. What caused this huge increase is a tougher question to answer, but the biggest improvements we observed in review scores have been from entertainment and dining, likely due to the increase in Broadway-style productions like “Rock of Ages” and “Chicago” on Norwegian and Royal Caribbean, along with branded food experiences by celebrity chefs like Bayamo by Jose Garces on Norwegian, Jamie Oliver’s Kitchen on Royal Caribbean and Guy’s Burgers by Guy Fieri on Carnival. 3. Disney dominates the industry, but Celebrity is catching up. 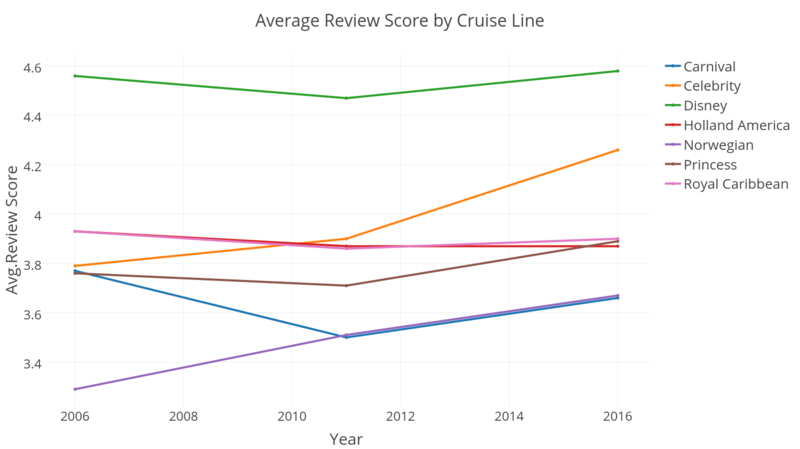 When looking at overall average review scores from the past decade, it’s clear that Disney is still the undisputed leader of the cruise industry. While the line’s prices are easily twice as high as its competitors and its four-ship fleet is a fraction of the size of other mainstream lines, Disney delivers a superior experience. The average scores of Princess, Royal Caribbean, Carnival and Holland America haven’t fluctuated much, but Norwegian has caught up to the rest of the pack after trailing significantly in 2006. Meanwhile, Celebrity has broken away and is chasing Disney’s top spot. 4. The fundamentals matter the most. 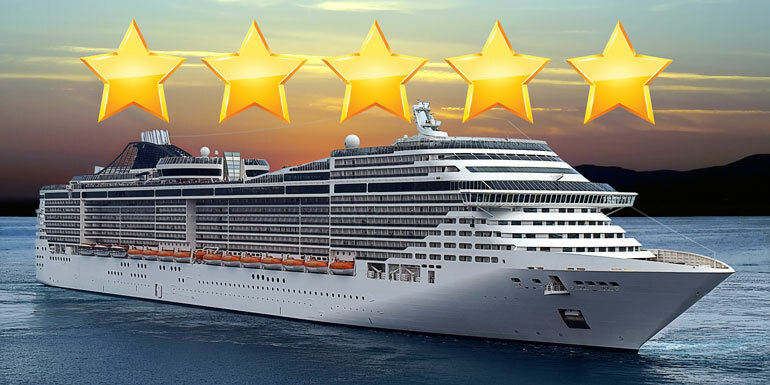 On every Cruiseline.com review, we give travelers the chance to rate and comment on specific aspects of the cruise. 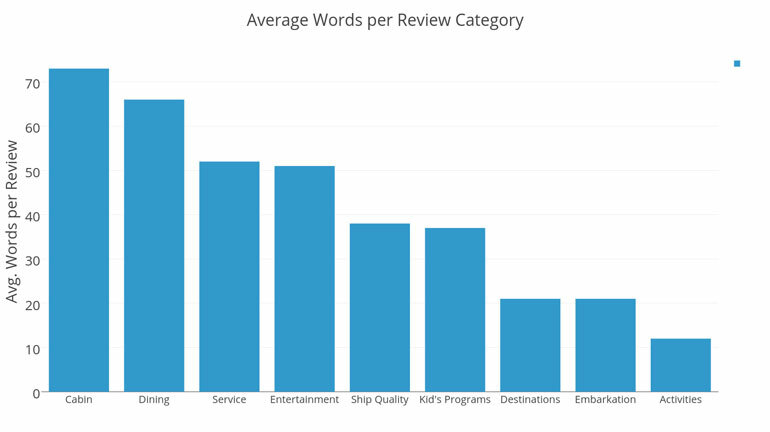 While cruise lines love to advertise their new onboard technologies, activities, and entertainment, on average, reviewers spend more time writing about the ship basics: dining, cabins, and service. While new bells and whistles may grab the attention of the media and attract new customers, ship staples seem to make the biggest impression. 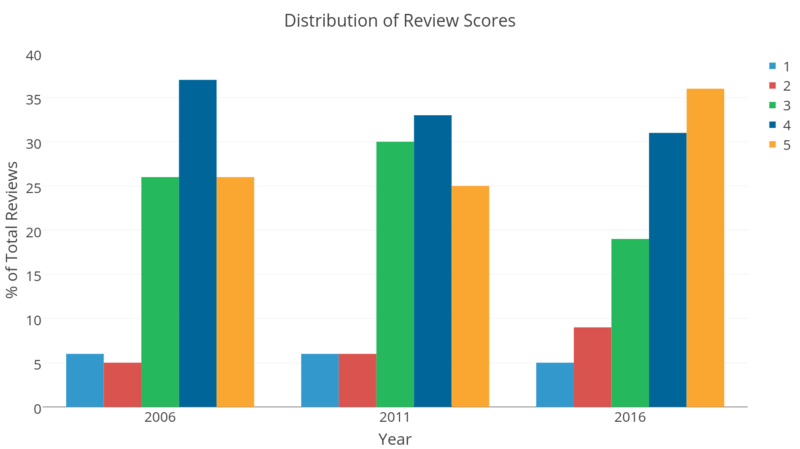 High-tech gadgets like robot bartenders and IMAX theaters may help fill cabins, but they won’t necessarily lead to a better review score. On average, reviewers spend an average of 139 words writing about cabins and food, which is 35% more than service and entertainment (103), and a whopping 2.3 times more than onboard activities and ship quality. 5. The best ports are not in the Caribbean. 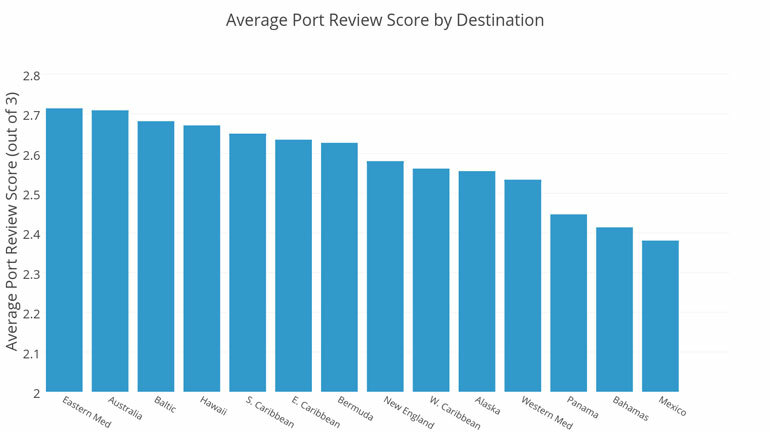 The most popular ports for cruisers are the Eastern Mediterranean, Australia / New Zealand and the Baltic, all of which have review scores 4-5% higher than the average Caribbean port. And, within the Caribbean, not all itineraries are created equal.While Western and Eastern Caribbean voyages sail roundtrip from major U.S. ports, Western itineraries have fewer days at sea while Eastern Caribbean ports are rated 4% higher. Southern Caribbean ports are the most popular, but require departures from ports like San Juan or longer sailings from American ports to reach them. Learn more about the Caribbean and all Caribbean destinations with our Caribbean Cruise Guide. 6. 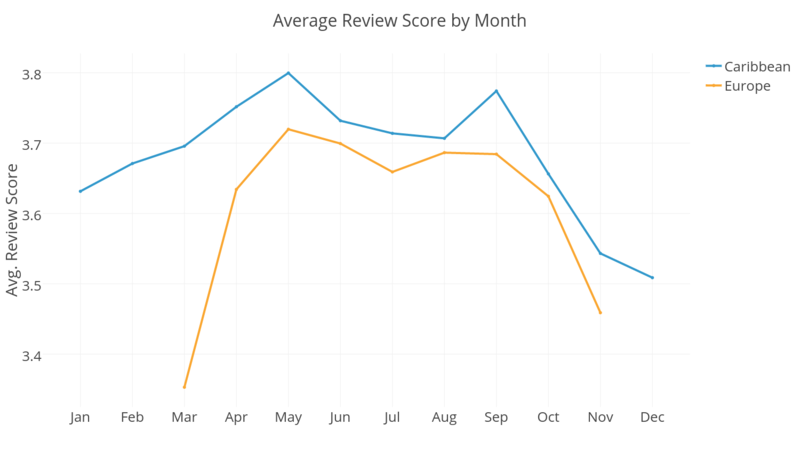 Shoulder-season sailings get better reviews. When sailing to the Caribbean, cruisers give slightly higher reviews during shoulder season (late spring and early fall). The highest rated months, were May and September, which are right before and after kids are off for summer vacation, so ships tend to be less crowded while prices are cheaper. Reviews are generally the lowest in the holiday months of November and December when fares are higher and ships are far more crowded. Cruisers sailing in Europe generally had better experiences in the summer months, with May in particular receiving the highest average review score. Not only is the weather better during the summer months, the major cruise lines will generally keep their newest and best ships in Europe from April to October and then redeploy those ships to the Caribbean for the winter. Which trend surprises you the most?